It’s hard to believe that Thanksgiving has come and gone. It’s my favorite holiday, so there is always a great deal of anticipation as the day approaches. 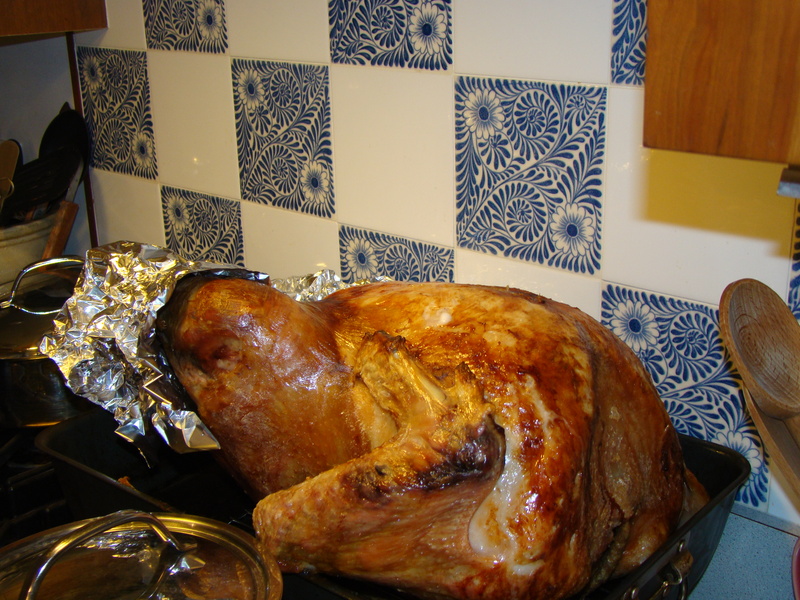 Plus, we were particularly excited to try our farm-fresh turkey. This year, we couldn’t get the logistics to work out for travel to parts south. That means we were not going to be celebrating the holiday with family. However, the next best thing to your own family is your “chosen” family of friends. We were fortunate to share our table with some of our favorite friends. As might be expected, my friends also enjoy cooking, so Laury, April, and I got together to plan the menu and divide up cooking responsibilities. Howard and I were hosts and cooked the core of the meal: turkey, gravy, stuffing, and mashed potatoes. I also snuck in the relish tray that always appears on his family’s Thanksgiving table plus the pink jello mold that always appears on mine. April provided the pre-dinner nibbles: Asti, cheese, hummus, and black olive tapenade. Laury made all the vegetables: roasted beets, baby Brussels sprouts, a roasted vegetable medley with turnips, carrots, and pearl onions, and a fresh salad with her sister Judy’s always-perfect salad dressing. John made cranberry sauce, even though he wasn’t able to join us for dinner. Laury’s mother Edith also treated us to caviar appetizers. After dinner, we travelled a few blocks away to April’s house for dessert. It was great to have a change of venue as the party continued. There were also a few new faces for company. Again, everyone contributed something. April made lemon squares and an apple caramel upside down cake. 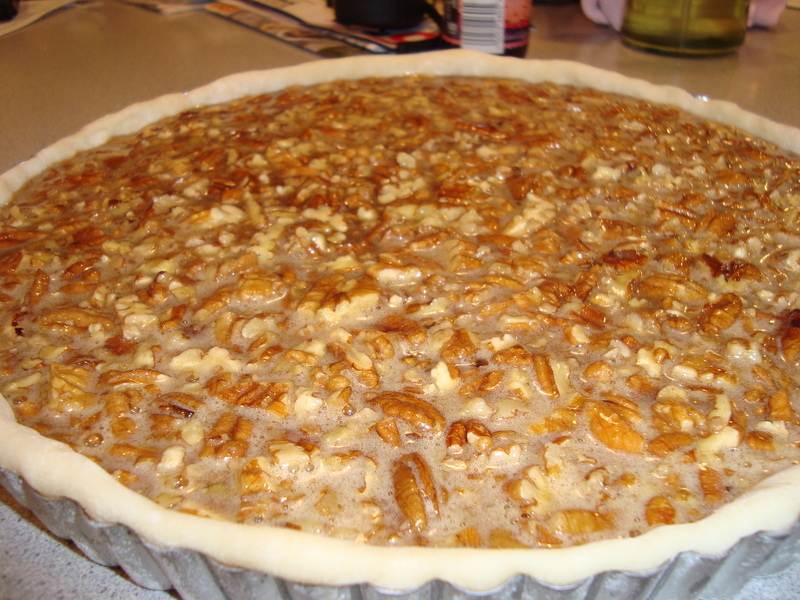 I made a pecan tart. Laury’s daughter Isabel made her very first pumpkin pie (and ate two whole pieces!). The turkey was all we had hoped for. Farmers Kim and Rich of Chestnut Farms raised a very tasty bird. There was some anxiety when the turkey gave off an unexpected amount of liquid during its early hours of roasting. We drained off all the liquid (which I was able to use for the stock in the gravy) and just kept going. The end result was just fine. The meat was moist and full of flavor. It garnered kudos from all the eaters. Going against the trend (based on the typical preference), our guests favored dark meat over white meat, so there was a lot of dark meat on the platter to see. Most surprising was just how dark the dark meat was. I don’t know whether it has to do with the leg muscles being well exercised as the turkey grazed in the pasture. Finding and supporting a growing number of farmers and other local sources for the food we eat, not just on Thanksgiving, but everyday. Posted on 28 November 2009, in General, Meat CSA and tagged Thanksgiving. Bookmark the permalink. 3 Comments. 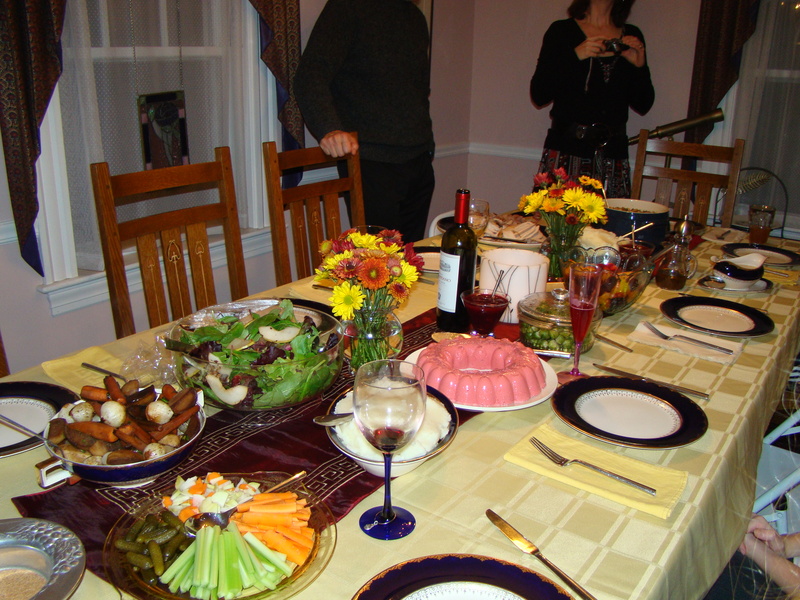 hi all- your turkey looks amazing and i love that you had a jello mold on your thanksgiving table. i love jello molds! Why don’t we ever make jello mold when we make Thanksgiving at your house? Next time, let’s be sure to. Actually, I only like red jello. My mother made the pink jello mold (red + sour cream = pink) for as long ago as I can remember. I think my sister had it on her thanksgiving table too. Of course the pink jello mold was on our table. But we missed having you around it!